As I recounted in my Essen 2003 report, this game was basically forced upon me by 2 overly eager Japanese game designers at a neglected and overlooked booth in Essen 2003. But somehow I knew this could be something, so I brought it along to our group until an opportunity arose to try it out. 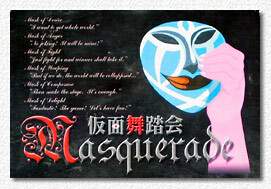 “Masquerade” is, like the Adlung evergreens “Verräter” and “Meuterer”, a boardgame disguising itself as a cardgame. First impressions are not overly impressive – the box is small, filled to the rim with (extremely sturdy) cards with manga-like pictures and an English rulebook in the dodgy translation that one probably expects. But don’t be deceived – this game really is better than you think! Players represent weird mythical forces who decide to play a game instead of destroying the world (now THAT is an interesting thought for our world leaders!). Each player selects a “mask” which gives him a secret victory bonus – you can decide to reveal it at any time in the game, but you forfeit any VP game from combat, if you do so (Although it is not clearly stated in the rules, we assumed that you can also hide yourself again if you want, but with the disadvantage that the other players now know who you are). Usually it is best if other players don’t know your secret VP bonus, but there are combats whose results are worse for you than keeping a secret. Each player now selects a “dancer”; who represents him in the fantasy world. Each dancer has different abilities and strengths – some let you play spell cards at a lower cost, some are stronger than others, etc., The turn order is also of importance (it is random in the first round, but then players choose another position than the one before each turn, an interesting system which works pretty well). If you want to go first you won’t get any advantages, but if you are happy to be late in the turn order you might get an additional heal for your dancer or draw additional spell cards. Now each player, in turn, selects a “place” where he puts his dancer to be active. Each place fulfils a different function: At the arena you challenge other players for combat to gain VP’s, at the library you replenish your spells, at the tower you fight a guardian to gain treasure, etc. Each place also has a stacking limit which means that if you come late in the turn order you might find the place you want to go filled up already. 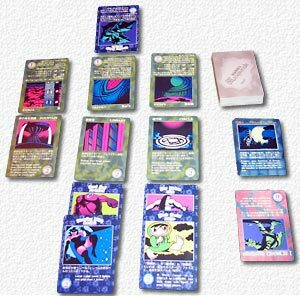 The spell cards are all important: They are played with a strength cost, meaning you have to remove additional spell cards if you cast a stronger spell. Spells are mostly very naughty, especially the spell which destroys other player’s spell cards (usually before they want to use them to fight a guardian monster). You need a lot of them, and a regular visit to the spell library is top priority. Interesting is also the place where you can gain “event” cards – these are chosen and not drawn randomly. Most effect cards affect all players, but there are also some devious ones like “wall flower” (see below), which work as a kind of super spell. Then there are also the “Emblems”, special VP cards which can change the owner, for example the first player who defeats another player at the arena gets the “sword” emblem (worth additional VP if you play a certain mask), the next player who then slays the emblem holder now gets the sword emblem and so forth. Fighting the guardians gains you treasure – you compare your dancer’s strength to the strength of the monster (the order of monsters to be defeated is not random, so you always know what you’re up against) plus a random spell card draw. Of course you will use spells to boost yourself up as well! The game ends when all monsters have been vanquished (did I mention that treasures give you additional abilities? ), when all event cards have been played, or the spell stack has been used up a certain number of times (depending on the number of players). Think “Cosmic Encounter” – although this game is not a copy, it certainly has a similar feeling to it. Chaotic? Yes, but you can clearly play it better or worse - if you have some grasp of strategy, the outcome will be more likely a win for you. Although the reception of this game at our table was mixed, I personally recommend it wholeheartedly. There is a lot of game for little bucks here. One final note: The English card translations are dodgy to say the least. A Japanese friend who checked the original also told me that the original Japanese is sometimes unclear as well! “Each player except the prophet loses 1 life. If one or more of these (life-losing) players has/have the most victory points, he/they lose 1 additional life”. I know – it still sounds dodgy, but that’s what it says.